Single-photon avalanche diode (SPAD) sensors provide photon detection with shot-noise-limited performance and pico-second timing precision. They are one of the main technologies in LIDAR, and also have a long history in quantum imaging and fluorescence lifetime imaging microscopy. In addition, SPADs have enabled demonstrations of light-in-flight and non-line-of-sight imaging. Traditionally implemented as point sensors, recent developments have resulted in SPAD arrays of increasing resolution and fill-factor (or photosensitive area), showing great potential in a variety of scientific applications. We here consider the use of oversampled binary SPAD sensors for high-speed imaging, especially in the context of microscopy. In these sensors, the raw output of binary fields (or “bit-planes”) of photon detections can be generated at frame rates in excess of 100 kFPS. 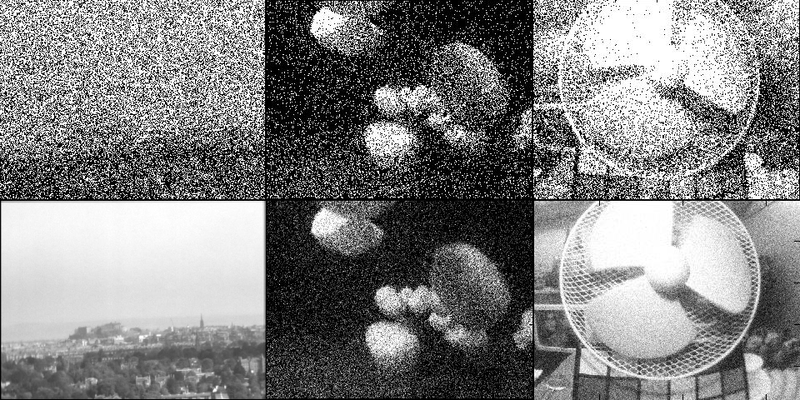 As readout-noise is negligible, bit-planes are summed off-chip to compose higher bit-depth (multi-photon count) images without any noise penalty. This enables image construction to be carried out post-experiment and optimised according to the imaging conditions and the individual objects being captured. We demonstrate the advantages of this approach in particle tracking and single-molecule localisation microscopy, as well as high-speed, low-light vision.